A Borderline Mom: What happens when you're the only one in the room who knows what a #meme is? What happens when you're the only one in the room who knows what a #meme is? Friday night I was sitting in my living room along with my friend and my husband while our hoodlum children played together. Said friend had brought McDonald's for her kids and had some cheeseburger left. 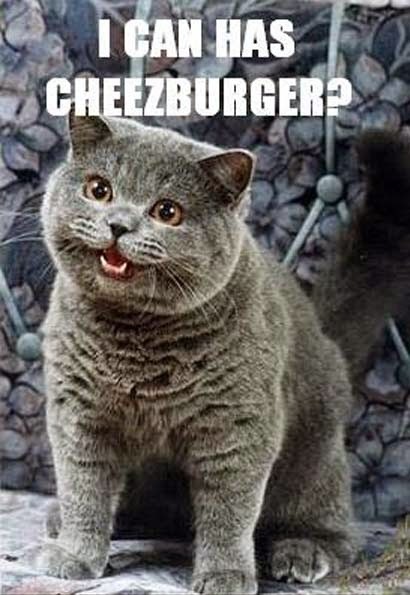 My cat snagged the bun off the top and I jumped on the opportunity to say, "She haz cheeseburger!" I turned to my friend and said, "you know what a meme is, right?" I looked at my husband and he said, "I know what a meme is, but I don't know what you're talking about." I'm sorry, Social Media, I've failed at sharing your awesomeness.